The Jenkins family have been well known and respected entrepreneurs in Pictou County for decades. So, in February 1990 when George Jenkins opened Crossroads Country Market he was really just carrying on the family legacy. George’s son Michael, another successful local business owner, built the building that houses the store and George operated the business. It was important to all that the store be a family business. The community was so happy to have a local store, on the day of the grand opening cars were lined up on both the Coalburn and Maclellans Brook Roads as people came by to celebrate. Really, the store is as much a community business as it is a family business. From the very beginning it has employed people from the area and that continues to this day. When the market first opened it employed seven people, today upwards of 19 people work at Crossroads. While every aspect of the store has had its successes the bakery has been a standout! The crispy, buttery and delicious oatcakes and fabulous dinner rolls were a resounding hit! Once word got out about the bakery (namely the rolls and oatcakes – not to mention the cinnamon rolls!) people drove from Westville, Pictou, and all over to buy them. Many people bought oatcakes to send to family across the country and even as far away as England or Scotland. 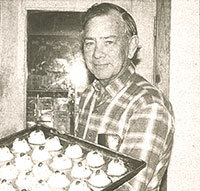 George Jenkins, founder of Crossroads Country Market, displays a sheet of freshly baked cookies from the Crossroads Bakery. A few years after opening the family added a canteen, this soon became well known for delicious fish and chips, pizza and more. To make room for the canteen and a larger bakery the store has been expanded three times, both out to the front and in the back. In December of 2013, George’s grandson Tyler MacLane took ownership of the business and the legacy. Tyler’s entrepreneurial spirit and way with people make him exceptionally suited to owning and operating Crossroads! Tyler and his wife Kristen have two sons and to have this opportunity to raise them in a rural area surrounded by family is important to them both. Stop by Crossroads Country Market for all of your general grocery needs, baked goods, or a snack in from the home-style canteen (with a weekly special that is right out of Moms kitchen). But Crossroads is more than that; you will find everything from local bottled preserves to fishing gear, greeting cards and gifts. When you shop at Crossroads Country Market you support a local family who cares about you and the community in which they operate and the quality of product and service they offer. They’ve been doing it now for over 23 years!